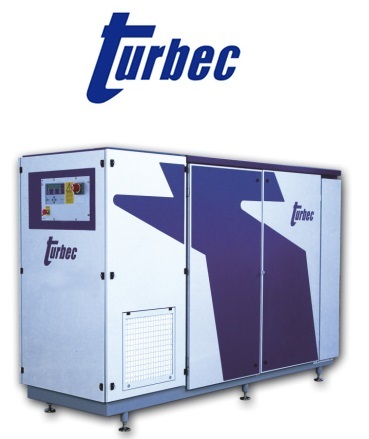 Turbec During the 1990s Volvo developed a small automotive gas turbine that was eventually employed as a static microturbine. A 100 kw gas fired unit features a water-cooled high speed alternator driven by a single shaft gas turbine with external recuperator. The engine is a conventional oil lubricated unit. Still in production today probably one of the only true competitors to the Capstone. Due to its size and weight no longer a contender for automotive use. 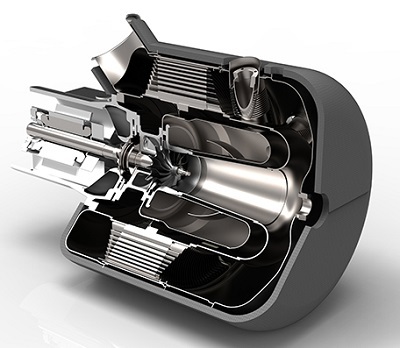 A Dutch company Micro Turbine Technology (MTT) have developed a unit known as the Enertwin. A 3.3 Kw microturbine is used as part of a CHP or co-generation system. It’s not clear if the unit is in production but it certainly looks a fully developed product. The company also suggests the unit may find applications as a range extender or a stationary generator on board trucks. A very innovative package suitable for large home/small business heating and energy needs. Ideal for part distributed generation, this type of unit could be the future? The Enertwin appears to consist of an oil lubricated turbocharger type gas turbine with a small high speed alternator built between the compressor and the turbine. A static recuperator is also added and a boiler for water heating. 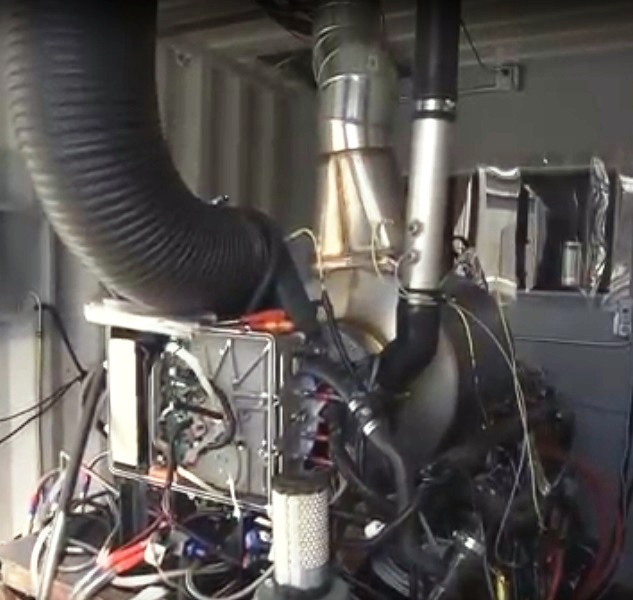 A Northampton based motor-sport company Delta Motor-sport has released a picture of a small approximately 15Kw microturbine unit for use as an EV range extender. A UK government sponsored project known as MiTRE - Micro Turbine Range Extender. A potential rival to the Bladon Jets unit perhaps? Bowman Power Systems A microturbine manufacturer based in Southampton UK. Back in the 1990s and 2000s this company produced a number of generator sets using an Elliot manufactured gas turbine unit and external recuperator. Bowman produced the alternator and electronics. 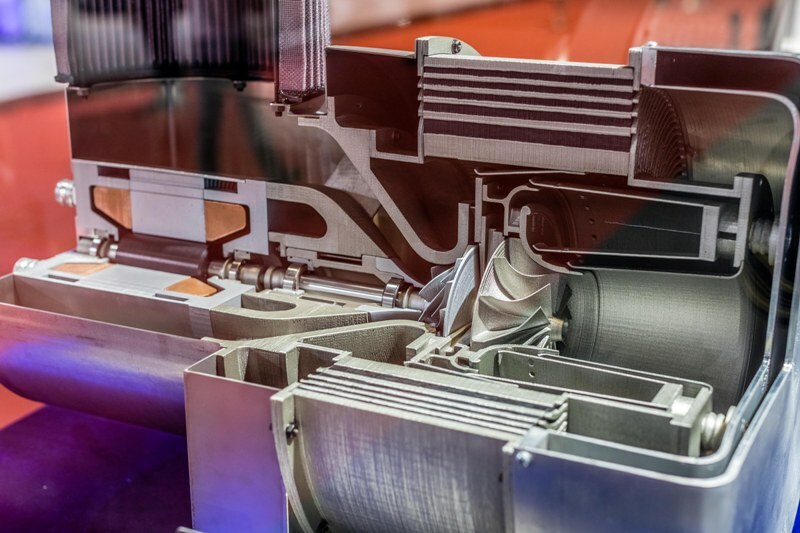 Systems up to 80Kw may have been produced, Bowman no longer manufacture MTGs but instead market a turbo-machinery based exhaust energy recovery device coupled to a high speed alternator. Capstone Clearly the World’s most successful microturbine manufacturer with a three model range and thousands of units (reportedly) sold Worldwide. A truly remarkable piece of innovative engineering. The product is like no other gas turbine engine ever built with a single moving part and large wrap around recuperator. The engine is coupled to sophisticated electronics that manage the flow of energy in and out of the turbine. The C30 30Kw model is able to operate on liquid fuel as well as gaseous fuels. The C30 demonstrates class leading fuel efficiency and emissions standards. A diesel engine without the diesel fumes! The C30 is primarily designed as a stationary unit but with some limited success has been achieved when used on-board vehicles as a range extender. For the 30Kw output it is bulky, fragile and heavy though and is not ideally suited to the harsh ride of sports cars. It’s not quite what the automotive industry has been waiting for and its actually been around for some 15 years pretty much unchanged! 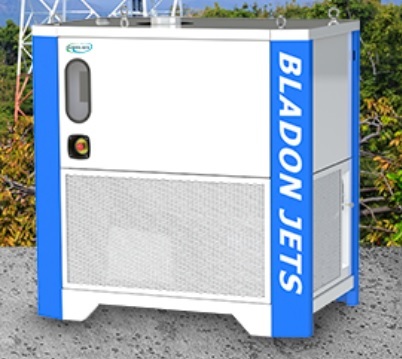 Bladon Jets (More) On their website Bladon Jets claim to be able to produce a 12Kw generator set, but no information is given as to when it will be available for sale and for how much. A number of claims are made regarding its sophistication. But what happened to the Jaguar blue lights and flash super car the C-X75? In 2010 Jaguar announced with much hype the proposal to build the turbine car only to withdraw a few years later. Their technical claims at the time were bordering on fraudulent to a very naive motoring press! Bladon have set up a factory in Coventry to develop the microturbine unit, they have now been at it for some time presumably with much investment from the parent company TATA. The question is will they succeed in the face of an enormous technical and economic challenge? Pictured here a disappointingly bulky 12Kw unit, the new MTG appears to have undergone design changes from previous published images, it’s not clear if the product is actually on sale? Elliott. 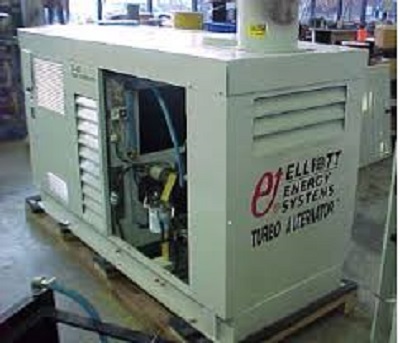 Elliott power systems have manufactured a number of microturbine units aimed at CHP. Two models have been offered a 80Kw unit and a 250Kw unit. The 80Kw unit may not be in production anymore. It consisted of an oil lubricated single shaft turbine engine driving a high speed alternator. Much of the electronics and alternator have been provided by the UK company Bowman. A large external matrix recuperator was used. A larger unit has also been developed using an industrial KG2 gas turbine retrofitted with a recuperator. Compared to the Capstone a bulky and complex unit that was unlikely to have been very successful. Ingersoll Rand Ingersoll Rand produced a unit known as the Powerworks Microturbine. 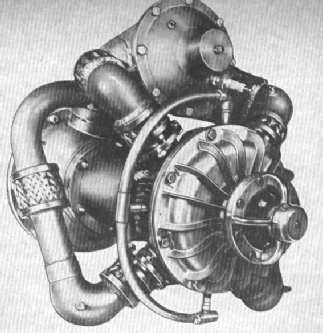 This unit consisted of a two shaft engine layout built from turbo-charger style components. A free turbine drives a low speed alternator via a reduction gearbox. 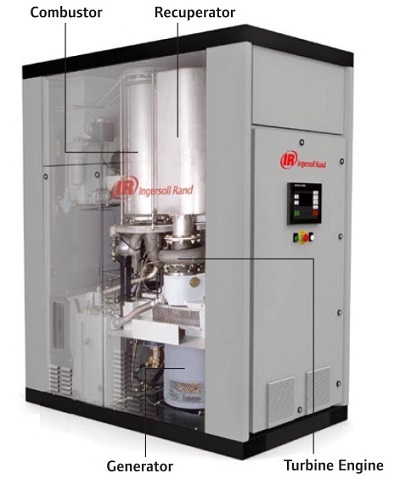 A conventional oil lubricated system. A large matrix type recuperator was fitted. These units are no longer produced and can be seen available on the surplus market from time to time. 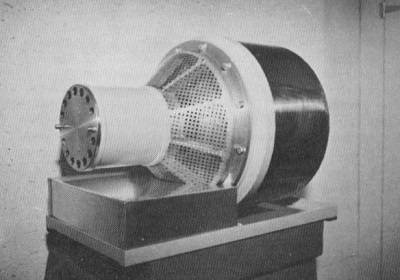 Garrett/Honeywell/Allied Signal Parallon 75; With their experience of turbo-chargers and small gas turbines Garrett ought to have known how to produce a microturbine. Developed from a military APU design. 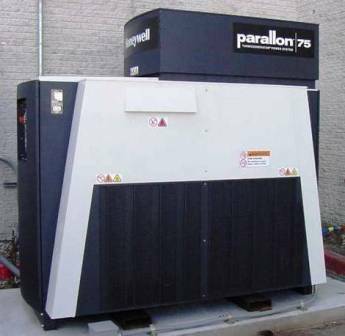 For a short while they did in the form of the Parallon 75 microturbine. 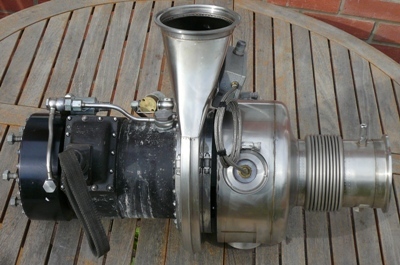 A turbo-charger style constructed unit with high speed alternator and recuperator. In 2001 Honeywell withdrew from the microturbine industry sector. Ishikawajima-Harima Heavy Industries Co., Ltd. (IHI) The Japanese company IHI developed the DynaJet 2.6. A truly remarkable unit and one of a kind. No other company has ever produced anything like it! It is simply a turbine copy of a piston engine product. A beautifully engineered and integrated product that is no longer produced. It cost new something like $10,000. 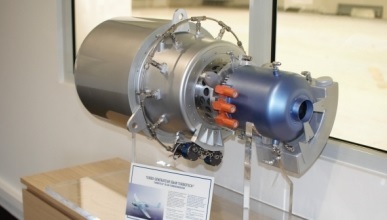 A development of this product could make a TREV (Turbine Recharged Electric vehicle) style range extender, IHI produce turbochargers and may other sophisticated heavy industry products so surely well placed to develop or further develop a microturbine? So why don’t they? 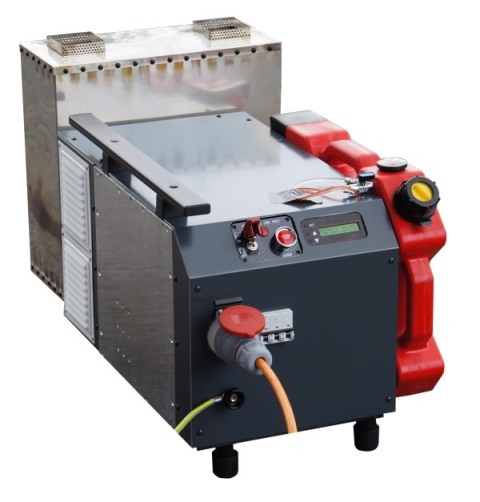 IHI have a developed a prototype suitcase unit producing 400W of power. Jakadofsky Jet-Volt Jakadofsky produce high quality model RC type gas turbines. They appear to be developing a portable generator set based on a single shaft RC turbine. Their engines adopt an unusual power takeoff and reduction gear arrangement that make them potentially suited to power generation. A medium speed permanent magnet generator may be driven from the turbine and also used for starting it. To date no other RC turbine design has been adapted to power generation. The model GT layout is not ideal for power generation, the primitive total loss oil system and small combustor will make meeting emissions targets a challenge! This non-recuperated unit will be very noisy and thirsty though, it will be interesting to see how well it will sell if at all? Although thirsty and noisy could this small turbine be used in a turbine recharged electric vehicle (TREV) as a “get you home measure”? ETC. 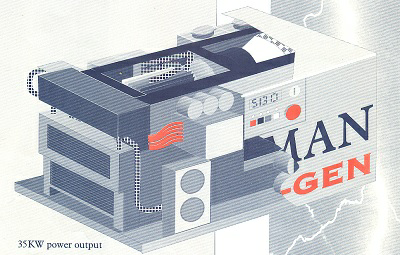 Sawyer’s Gas Turbine Catalogue 1976 reports the existence of a small oil-less unit producing 5Kw. A was built to be the back-up generator for telephone exchanges- the forerunner of modern IT infrastructure. Over that decade the Sawyer’s journal reports the existence of a number of small GT projects many of them that must have been still-borne. At the time there was an optimistic future predicted for gas turbines. No trace of the ETC unit has been found today. The Capstone share price performance; In an increasingly energy and emissions conscious World would you expect Capstone to do well? At $1.48 not so, so why not develop a practical microturbine range extender based on all that Capstone development experience? It would surely have the potential for Worldwide sales? Turbogenset The late Colin Besant of Imperial College London developed a special high speed axial flux alternator. 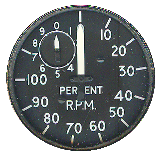 The alternator was suitable for direct connection to a small gas turbine and ran at up to 60,000 rpm. 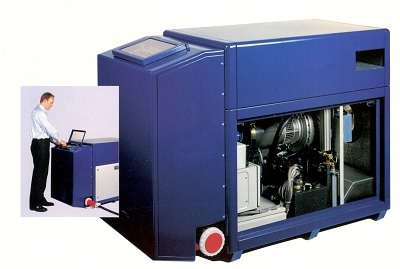 In the 1990s the Turbogenset company was formed to exploit this technology, initially they developed their own simple gas turbine, they later adopted a unit made by the CZ company První brněnská strojírna Velká Bíteš (PBS). PBS produce a series of small gas turbines based on, and developed from, the Microturbo Saphir unit. A 50Kw genset was produced based on the Saphir derived gas turbine driving the alternator at 50,000 rpm. Such a unit was exhibited at the Farnborough air show. It’s not clear how many gen-sets were sold, it doesn't appear that this non-recuperated unit was successful and they are no longer sold. It was suggested in marketing and articles that the system was appropriate for sue in vehicles and was perhaps the for-runner of the range extender vehicle concept still yet to be proven. 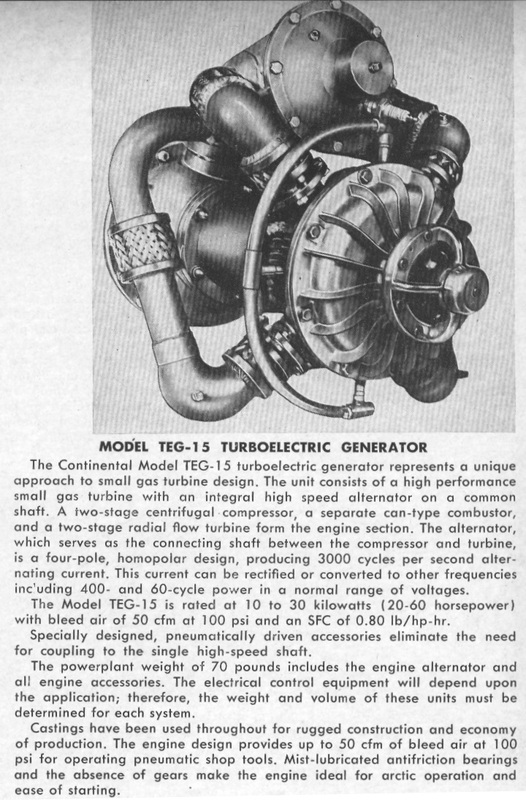 More on Turbogenset. Saurer The Swiss truck and bus company Saurer named after Adolph Saurer and based in Arbon Switzerland produced a small gas turbine the GT15. The GT15 is technically an aero-derivative unit and was built as an APU for the HFB320 business jet in the 1960s. Only very few were made but it represents and example of an innovative technical venture many years ago. This single shaft unit produced just 15HP at 85,000 rpm. A clever design uses the fuel as a lubricant and adopts a revolving atomisation process similar to many Turbomeca designs today. If only it could have been produced in greater numbers and could find a wide spread application. Imagine if it could be used as a 10Kw range extender? Some lesser known turbine cars - what ever happened to them? The Volvo Environmental Concept Car (ECC). Circa 1992 was well ahead of it’s time adopting the turbine recharged battery configuration. One of many problems was the lack of battery capacity so it would have been a mostly turbine energy source vehicle. 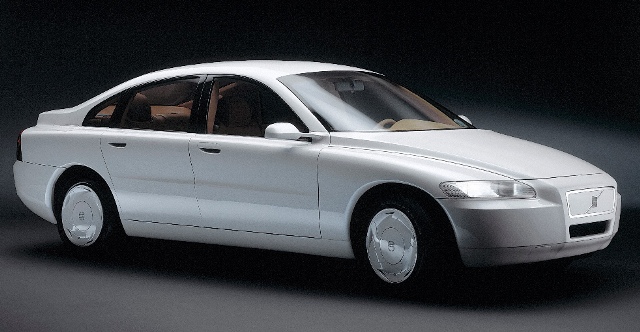 In 1992 a very futuristic design now familiar as the Volvo V70. The Volvo gas turbine engine operated at 90,000 rpm and directly drove a turbo alternator to produce electricity for the traction motor. It can be seen that the layout uses a rotating heat exchanger to act as a recuperator and improve thermal efficiency. 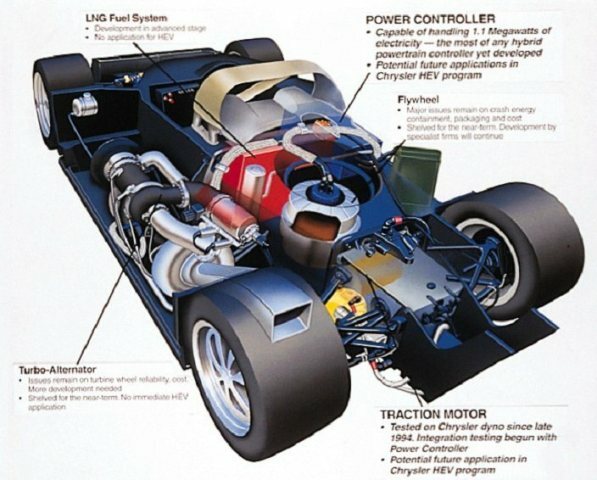 Chrysler developed a special hybrid sports car in the early 1990s to compete at Le Mans. This featured a two stage gas turbine driving a turbo alternator to provide electricity for a traction motor. The vehicle also adopted a flywheel energy recovery system. Detailed research and observations of published current and past information on the internet have indicated the presence of a number of past and current micro gas turbine (#microturbine) designs. Some of which could be employed in the Turbine Recharged Electric Vehicle (#TREV) role. Industry journals such as "Sawyers World Gas Turbine Catalogue" and "Aircraft Engines of the World" also provide a fascinating documented conduit in to the less recent small gas turbine past. Up to some 50 years ago! It would appear microturbines have been extensively developed and researched over these many decades. A number of highly qualified and experienced companies have tried and apparently failed, given up or found it simply too costly to continue. These companies include car companies such as Chrysler, Toyota and Volvo, but also energy companies such as Bowman Power Systems, Turbo Genset Company and the mighty Honeywell. If Honeywell can't do it who can? And what about turbo-charger companies such as Holset, Garrett (Honeywell), Schwitzer and IHI? 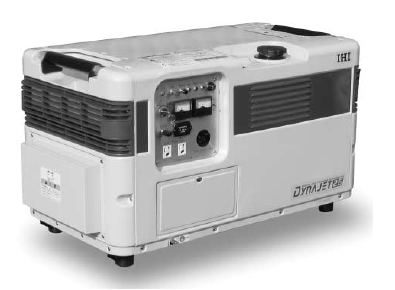 - Only IHI have briefly succeeded (With the portable microturbine Dynajet 2.6 model) but sadly now withdrawn form the market. And couldn't Rolls Royce have a go? Imagine the kudos of a svelte and sophisticated luxury solon gliding along to the hushed whoosh of a microturbine developed by RR. A RR engine in a RR car (and not a German built BMW V12!). In reducing military and consolidated civilian aero-engine markets couldn't those highly experienced and qualified RR gas turbine engineers turn their hand to this? 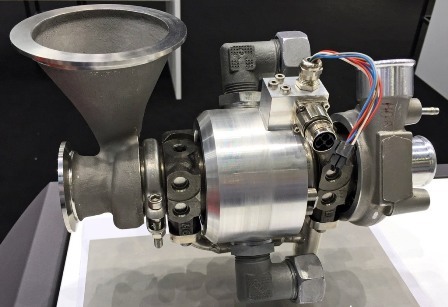 What may have changed today (in the microturbine's favor) is the energy markets and the emergence of electric vehicles, also development tools such as CFD (Computational fluid dynamics), rapid prototyping and 3D printing were not previously available. The small gas turbine certainly requires all of these as drivers to help the difficult and complex gestation of a viable and economic product. The electric vehicle market is expanding fast, at least one driver is the advancement of batteries this partly comes from outisde the automotive industry in the form of protable devices. Would batterie technologies and chemistries be so energy dense if it wasn’t for mobile phones, laptops and tablets? The microturbine doesn’t have an outside drivering force? Apparent development remains slow (greater progress may of course be the case but kept in secret until the right time for a product launch), Capstone have been around since the 1990s and the indicated product portfolio remains relatively conservative. Other companies such as Bladon Jets (established around 2010) and and MTT publish seemly encouraging criteria but will their products really make it to market? And when? Vehicle battery technologies continue to improve and for stationary applications in some parts of the World there is fierce competition from Solar energy as the price per Kw falls. At some $1000/Kw the Capstone price doesn't look too favorable compared to Solar. So will Bladon Jets fair any better? 12Kw is not a lot of power from a relatively large installation and it is suggested the application is simply power for mobile phone infrastructure. Does it make sense to consume fossil fuels when renewables may be present at the cell sites with relative abundance? What happened to the super-car aspirations? The Bladon Jets MTG12 doesn't look like it would fit in to the trunk of C-X75! No mention of microturbines at velozzi.it today? There is also the Wright-speed company in the USA. So far much is published about the benefits and cost savings of microturbine powered garbage trucks. Currently powered by the same fifteen year old design the Capstone C30. A new more sophisticated microturbine of their own making is promised but is it out their yet actually propelling these vehicles? Detailed inspection of promotional material seem to confirm that what is actually fitted is the Capstone C30, the promised Fulcrum turbine is yet to be installed? The C30 has been trialed in other similar weight vehicles with little long term success, will the Fulcrum fare better? Of course companies engaged in automotive microturbine work are not simply in it for the finished goal, it's the technical journey also. Spin-offs, technological intellectual property and of course lucrative patents may be generated. 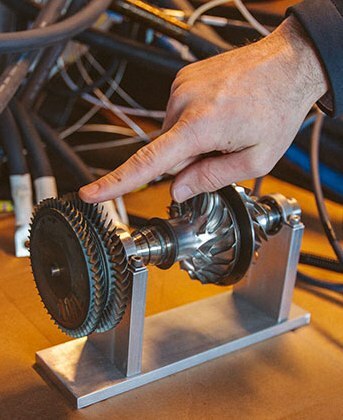 Government and EU grants are available such as the UK government sponsored MiTRE (Microturbine Range Extender) funding, these help to kick-start the industry in the hope that it (a bit like a gas turbine itself) will one day become self-sustaining and create it's own marketplace, industry and jobs. It's believed Bladon Jets have received sponsor type funding also. 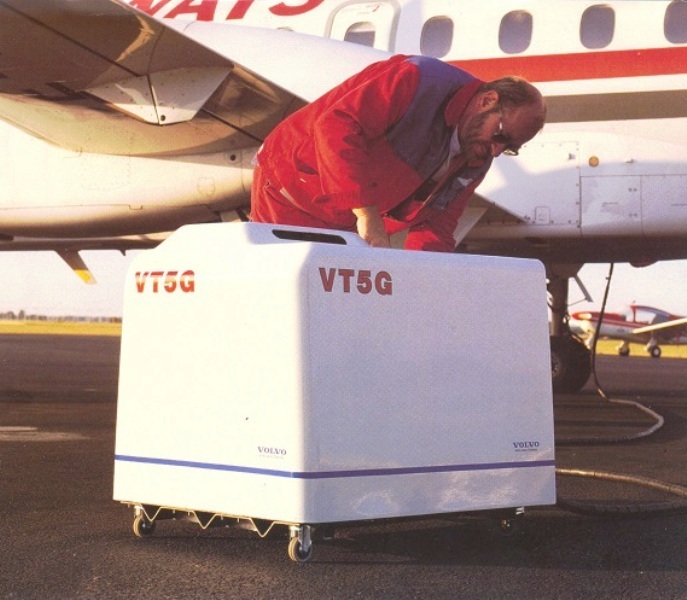 Volvo Aero Turbines a now defunct subsidiary of Volvo produced a lightweight ground power unit for use with aircraft. 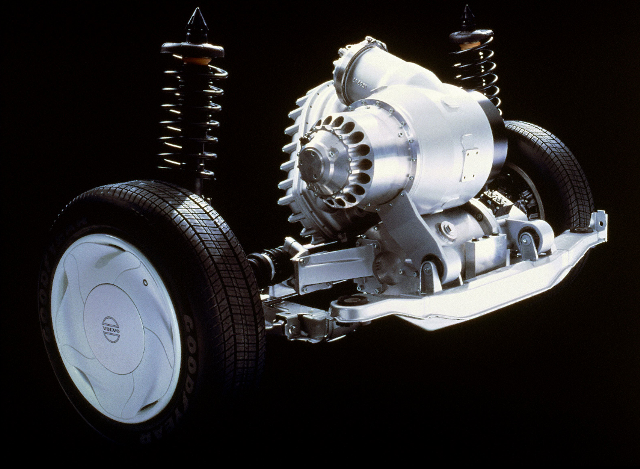 Known as the VT5G this unit was developed from the automotive single shaft units that Volvo experimented with in vehicles. The unit ran at 90,000 rpm and was rated at up to 50Kw producing 400Hz and 28V DC outputs. The unit measured 850 x 600 x 500mm and weighed some 135kg including fuel tank. It’s not known if this unit was ever put in to production? HK Motors a Chinese company produces a range of electric buses and may also have ambitions to prod cue electric cars. A sophisticated range of SUV type vehicles has been showcased including a turbine range extender. As usual not much is published regarding the micro turbine and predictably a Capstone-like mock up unit has been displayed in public. Question is, what real experience do the Chinese have in micro gas turbine design and manufacture? Wrightspeed’s own Micro Gas Turbine shown on a test bed. Wrightspeed have made ambitions claims regarding the development of their own micro gas turbine range extender. For use in trucks a two stage unit with recuperator is proposed to supplement a battery electric drive system developed for heavy duty vehciles. CAD type illustrations show a compact integrated power unit, the prototype reality looks somewhat bulkier! So if and when will such a unit actually power a truck? As with all other microturbine vehicle projects only the Capstone unit has been driven on public roads, despite many optimistic claims. A 30Kw unit names Range+ appears to be in development by Mitsubishi Turbocharger and Engine Europe. With components such as recuperator and alternator provided by third party partners this unit looks to be a quite conventional layout. The exact scale of the unit is not clear it could be quite balky, 30Kw is a high output for a range extender perhaps it’s intended for an SUV type vehicle? If will face many production challenges as well as meeting stringent performance targets if it’s to be genuinely viable. It would be great to see one of these many prototypes actually propelling a vehicle! A future of electric or hybrid electric aircraft now looks a possibility but many challenges are ahead including certification and airworthiness issues, pilot qualification and public air transport issues. At least experimental electric aircraft are set to fly in the next few years both fixed wing and VTOL. The combination of a jet fuel burning turbo-generator and high energy-density battery pack could be the efficient, greener and safer alternative to today’s aircraft architectures. The certified aviation world is very conservative most planes and helicopters fly with power plants developed and evolved over decades. Most small private aircraft are powered by piston engines developed in the 1950s and 1960s. These power plants are safe, reliable and very well understood it will take a revolution to change them!